No matter what your age, you probably know what someone means when they say “Little Golden Books.” They’re skinny kids books with a gold spine that pretty much everyone owned. 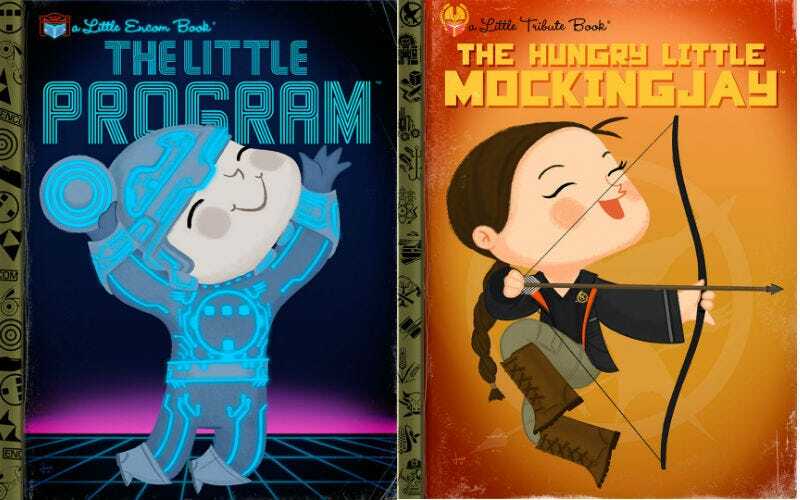 Well, artist Joey Spiotto has taken the look of those old books and updated them with takes on classic and current pop culture alike, from Tron to Hunger Games. Spiotto (who also has a new book out) is about to debut Storytime 2, a second solo art show of “demented” children’s books. He takes the Golden Books blueprint and then tweaks it with jolly images from some of your favorite movies, TV shows and music. (You may remember his first Golden Book show, too). The new show opens at Gallery 1988 East in Los Angeles on Friday, November 6, and remains on display through November 21. More specifics can be found here. Below are just a few of the 50 new pieces that’ll be on display. If you can’t make it to the gallery, all of the images will go on sale Saturday at www.gallery1988.com.